These guidelines are for service providers and commissioners of mental health services to help them to ensure high quality and cost effective delivery of care and support for people experiencing a first episode of psychosis. Published in 2012, these guidelines describe the key elements of service design for the delivery of Early Intervention in Psychosis (EIP). 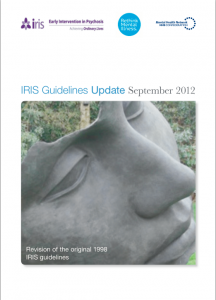 They replace the original 1998 IRIS guidelines which had informed the National Service Framework for Mental Health (NSF; DH 1999) and its accompanying Policy Implementation Guide (MH–PIG; DH 2001). Specific guidelines are provided on every aspect of care from how to create a youth friendly culture to specific evidence-based statements regarding drug and psychosocial interventions.